SMC uses a crocodile as VSY 2017 mascot. SIBU: The 563km Rajang River, the longest in the country, makes Sibu a unique place, says Sibu Municipal Council (SMC) deputy chairman Dato Andrew Wong. Besides that, the unique way of life of longhouse people along the river give tourists an unforgettable experience, he added. “If you use speedboat going down the river in Tutus area, crocodiles can be seen sunbathing by the river bank. 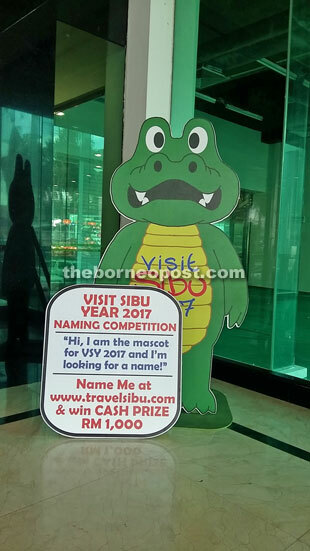 “So by using a crocodile as Visit Sibu Year (VSY) 2017 mascot, we portray adventure and ecotourism along Rajang River to attract visitors,” he told a full council meeting yesterday. the public in the social media. Wong said visitors were fascinated by how local people especially those living along Rajang River had integrated with nature. “Even though there are roads and electricity and water supplies our local Bumiputeras are still well connected with nature. “Tourists are amazed by that. That is something they are trying to experience for themselves,” he said. On a similar matter, Wong said it was time for the council to revitalise Bukit Aup Jubilee Park. Earlier, Cr Abang Iskandar Abang Latip suggested to the council to bring back live crocodiles to the park, saying it would attract tourists. Meanwhile, the closing date for the VSY 2017 mascot naming competition is Feb 29. It is open to all Sarawakians and those interested can log on to www.travelsibu.com. Cash prize of RM1,000 awaits the winner. VSY 2017 is scheduled to be launched on March 12 at Sibu Town Square Phase 1 by Chief Minister Datuk Patinggi Tan Sri Adenan Satem.